The End of British Party Politics? Elections ask voters to choose between political parties. But voters across the UK are increasingly being presented with fundamentally different, and largely disconnected, sets of political choices. This book is about this hollowing out of a genuinely British democratic politics: how and why it has occurred, and why it matters. Electoral choices across Britain became increasingly differentiated along national lines over much of the last half-century. In 2017, for the second general election in a row, four different parties came first in the UK’s four nations. UK voters are increasingly faced with general election campaigns that are largely disconnected from each other. At the same time, voters acquire much of their information about the election from news-media based in London that display little understanding of these national distinctions. The UK continues to elect representatives to a single parliament. But the shared debates and sets of choices that tie a political community together are increasingly absent. Separate national political arenas and agendas still have to interact but in some respects the House of Commons increasingly resembles the European Parliament – whose members are democratically chosen but from a disconnected series of separate national electoral contests. This is deeply problematic for the long-term unity and integrity of the UK. In the swirl of current UK politics, this book provides important insights for everyone who cares about the vigour of democracy and the unity of our country. 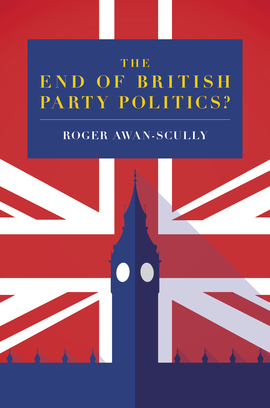 Through perceptive and readable analysis, Professor Awan-Scully shows how politics is fragmenting between the constituent parts of the UK, and raises the challenge of how to recreate meaningful and appealing British party politics with the vitality necessary to prevent introversion and break-up. Awan-Scully, an academic, presents a compelling case, and even readers who know this territory well will learn something new. If a chunk of the UK does fall off at some point in the next few decades, this will be one of the key books that explains why. Trying to make sense of the implosion of all-British party politics is one of the prime challenges of our time. Roger Awan-Scully provides a hugely valuable guide to the forces that have reshaped party politics across the United Kingdom. And he poses sharp questions for politicians, for the media and for the voters themselves. An absorbing guide to how British politics is changing, how it happened and why it matters. This isn’t just an excellent piece of analysis; it’s a thrilling read. I will now spend my days actively wishing for a schism in British politics, just so that I can read what Prof. Roger Awan-Scully has to write about it.